Victoria is chock full of tourist attractions, with Melbourne providing a slew of worthy urban sightseeing opportunities, and the state's scores of national parks promising a varied playground for outdoor enthusiasts. 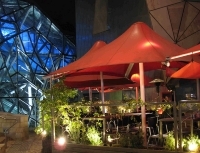 Within Melbourne, top tourist attractions include Federation Square, Queen Victoria Market, the lofty Eureka Tower, Melbourne Zoo, Melbourne Cricket Ground (MCG), and a wealth of museums and galleries. There are about 45 protected wilderness areas in Victoria, encompassing glorious rainforests, high mountains, and pristine stretches of coastline. The most popular national parks in Victoria include Dandenong Ranges National Park, Grampians National Park, Wilson's Promontory National Park, Mornington Peninsula National Park, Alpine National Park, and Tarra Bulga National Park. Victoria is celebrated as an agricultural gem, with some splendid wineries and great local produce. This rich farming heritage contributes to the gourmet culture, and foodies should be sure to experience the vineyards, restaurants and farms of the state. History buffs will also enjoy exploring the Gold Rush towns of Victoria, with the chance to take some underground tours of the old mines.